Help us celebrate our 3rd anniversary as we present four different handpicked bands that we think you need to hear right now. 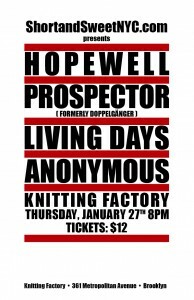 Performers include Psychedelic rock act Hopewell, dance-punk outfit Prospector, retro-80s inspired band Living Days, and hip hop up-and-comer Anonymous. If you’re feeling German BBQ, you can head over to Fette Sau (fat pig in German), where the owners of nearby bar Spuyten Duyvil have opened up this meat only restaurant serving up some of the best pork and beef in NYC. For drinks, Spuyten Duyvil is a beer lovers dream, with a selection from all over the world, friendly and knowledgeable bartenders and a neighborhood feel, it’s no wonder this place has been so successful. If you’re still ready for more, you must hit Union Pool, where there’s always a band playing, great DJs, and plenty of action.